"This box leaves the heavy lifting to the experts, saving both the time of going to the nearest comic shop, which isn’t anywhere close by for many, as well as trying to decide which comic to choose, which likewise can be quite daunting. No hassle, no stress, open the box, put your feet up and immerse yourself in the world of the heroes and villains! When I received The Retro Store Monthly Comic Club Box, it was delivered in a letterbox-friendly, flat cardboard box, just the right size for comic books and ensuring that all the comics arrived undamaged. The last thing you want is a damaged product, so this was a great start to my subscription. 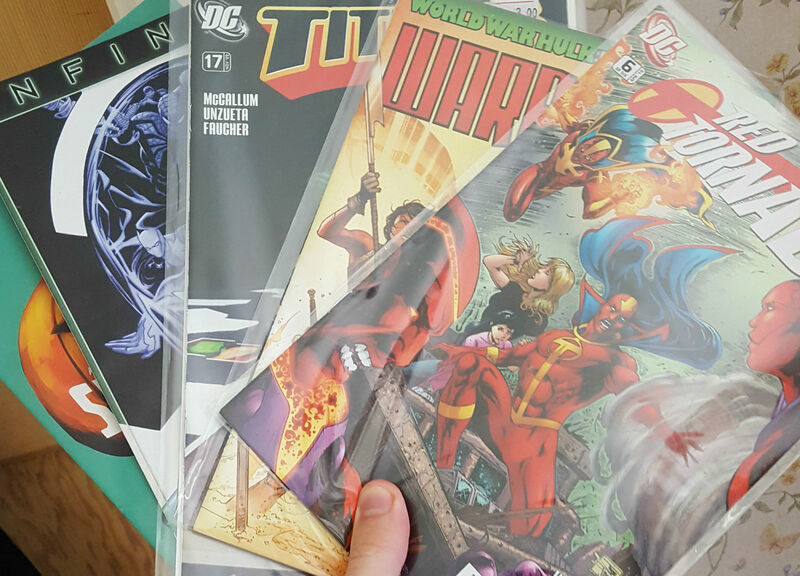 After tearing my way through the packaging, I was welcomed by five different comics, each unique and from different story arcs of the comics world, such as Red Tornado from Supergirl, Warbound from the World War Hulk comic series and Spider Woman, which I especially enjoyed. During my unboxing, I also noticed The Retro Store team had included a packet of sweets which was a welcomed bonus! The subscription box is typically split into either DC comics or Marvel comics, which is an excellent idea for those die-hard fans. The box I received included comics from both, which I think would be a perfect option for those like myself who enjoy both Marvel and DC and want to build their collection. I had a fantastic time going through each of my comics; it's always great to have them at your fingertips while finishing the sweets faster then I had intended! I particularly liked having my comics selected for me, saving me the time and effort of picking them myself and now sitting proudly in my growing collection of comics. I cannot wait to see what other gems they will pick out for me next. If I had to be nit-picky about the box, I would say that five comics over the space of a month doesn’t last long enough for me, as I'm someone who reads very quickly! But if you're a patient reader, then it'd probably be fine. However, ultimately the box is about introducing you to a selection of new comics each month; discovering new series' without the concern of whether you're going to love it or not, leaving you to further invest in the stories you enjoy, and on that front, it's perfect. Price-wise, you are going to be saving not just money (on the RRP), but time and effort too. Depending on your willingness to commit to either a 6 or 12-month subscription, you can also save yourself between £10-£25 over the course of a year as well. For me, getting comics to your door is worth the RRP value alone, but the saving on top is the icing on the cake to an already impressive box. All I need to say about The Retro Store Monthly Comic Club Box is that it is awesome, it ticks all the boxes of what I would want and expect from a comic subscription box. If you have been looking to expand your growing collection of comic books and wanted to see what else is out there, or if you've never picked up a comic book in your life, The Retro Store Monthly Comic Club Box is an excellent and easy way to get started! Perfect to give as a gift to a loved one, or maybe just a gift for yourself, go for it, you deserve it! Can’t get enough of your favourite Marvel or DC superheroes? Immerse yourself in their stories and watch the adventures unfold with a monthly box delivery of five unique, handpicked comics from The Retro Store Monthly Comic Club. Don’t miss out on the action!